Baker, C. and Silverman, R. (2005). Misperceptions about White Gloves. International Preservation News N° 37 December, 4-9. Bennett, J. (2010). Vibrant Matter: A Political Ecology of Things. Durham, N.C.: Duke UP. Bornstein, G. (2001). Material Modernism: The Politics of the Page. Cambridge: Cambridge UP. Brown, C. (2011). Manuscript Thinking: Stories by hand. Postmedieval: A Journal of Medieval Cultural Studies 2 (3): 250-268. Burns, J.E. (2014). Digital facsimiles and the modern viewer: Medieval manuscripts and archival practice in the age of new media. Art Documentation: Journal of the Art Libraries Society of North America 33, 148-67. Candlin, F. and Gains, R. (2009). The Object Reader. London: Routledge. Chassanoff, A. (2013). Historians and the Use of Primary Source Materials in the Digital Age. The American Archivist 76 2, 458-80. Cifor, M. (2017) Stains and Remains: Liveliness, Materiality, and the Archival Lives of Queer Bodies. Australian Feminist Studies 32,91-92, 5-21. Coole, D. & Frost, S. (2010). Introducing the New Materialisms. In J. Bennett, P. Cheah, M.A. Orlie, and E. Grosz (Eds.) New Materialisms: Ontology, Agency, and Politics (pp. 1-43). Durham, N.C.: Duke UP. Derrida, J. (2005). Paper Machine. Trans. R. Bowlby. Stanford, Ca. : Stanford UP. Dever, M. (2013). Provocations on the Pleasures of Archived Paper. Archives and Manuscripts 41.3, 173-182. Dever, M. (2014). Manuscripts and Photographs: Being in the Archive. Archives and Manuscripts 42.3, 282-94. Drucker J. (2009). Entity to event: From literal, mechanistic materiality to probabilistic materiality. Parallax 15.4,7-17. Drucker, J. (2013). Performative Materiality and Theoretical Approaches to Interface. DHQ 7.1. Dworkin, C. (2013). No Medium. Cambridge, Mass. : The MIT Press. Dworkin, C. (2010). The Perverse Library. London: Information as Material. Farge, A. (2013). The Allure of the Archives. Trans. T. Scott-Railton. New Haven, CT.: Yale UP. Fuchsberger, V. et al (2014) The Multiple Layers of Materiality. DIS Companion ’14 Proceedings. New York: ACM, 73-76. Gitelman, L. (2014). Paper knowledge: Toward a media history of documents. Durham, NC. : Duke UP. 2014. Gumbrecht, H.U. (2004). Production of Presence. What Meaning Cannot Convey. Stanford: Stanford UP. Hayles, N.K. (2004). Print is flat, code is deep: The importance of media-specific analysis. Poetics Today 25.1, 67-90. Heesen, A. te (2014). The Newspaper Clipping: A Modern Paper Object. Trans. Lori Lantz. Manchester: Manchester UP. Hennessy, K. and Smith, T.L. (2018). Anarchival materiality in archives. Archive/Counter-Archives. Public 57, 128-44. Hull, M. (2012). The Government of Paper: The Materiality of Bureaucracy in Urban Pakistan. Berkeley: U of California Press. Kafka, B. (2012). The Demon of Writing: Powers and Failures of Paperwork. New York: Zone Books. Krajewski, M. (2011). Paper Machines: About Cards and Catalogs, 1548-1929. Trans. Peter Krapp. Boston: MIT Press. Jardine, B. (2017). State of the Field: Paper tools. Studies in the History and Philosophy of Science 64, 53-63. Lester, P. (2018) Of mind and matter: The archive as object. Archives and Records 39.1 73-87. Mak, B. (2011). How the Page Matters. Toronto: U of Toronto Press. Manoff, M. (2006). The Materiality of Digital Collections: Theoretical and Historical Perspectives. Portal: Libraries and the Academy 6.3, 311-325. Rekrut, A. (2005). 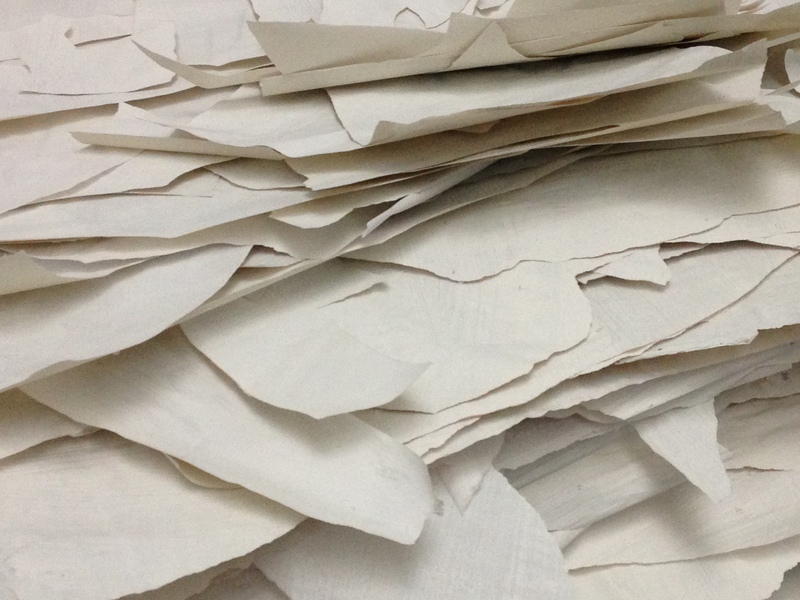 Material Literacy: Reading Records as Material Culture. Archivaria 60, 28-29. Rekrut, A. (2014). Matters of substance: Materiality and meaning in historical records and their digital images. Archives and Manuscripts 42.3, 238-247. Riles, A. (ed.) (2006). Documents: Artifacts of Modern Knowledge. Ann Arbor, MI. : U of Michigan Press. Rimmer, J. et. al. (2008). An Examination of the Physical and the Digital Qualities of Humanities Research. Information Processing and Management 44.3, 1374-1392. Sansom I. (2012). Paper: An Elegy. London: Fourth Estate. Sellen, A. and Harper, R. (2002). The Myth of the Paperless Office. Cambridge, MA. : MIT Press. Socarides, A. (2012). Dickinson Unbound: Paper, Process, Poetics. New York: Oxford UP. Vaknin, J., Stuckey, K. and Lane, V. (2013). All This Stuff: Archiving the Artist. Faringdon: Libri. Vismann, C. (2008). Files: Law and Media Technology. Stanford, CA. : Stanford UP. Wood, H. (2000). The Fetish and the Document: An exploration of attitudes towards archives. In M. Procter and C.P. Lewis (eds.) New Directions in Archival Research. Liverpool: Liverpool University Centre for Archive Studies, 20-48. Yamada, L. (2006). What should I do with paper ephemera? Looking after ephemera in a library. Art Libraries Journal 31.4, 1-20.